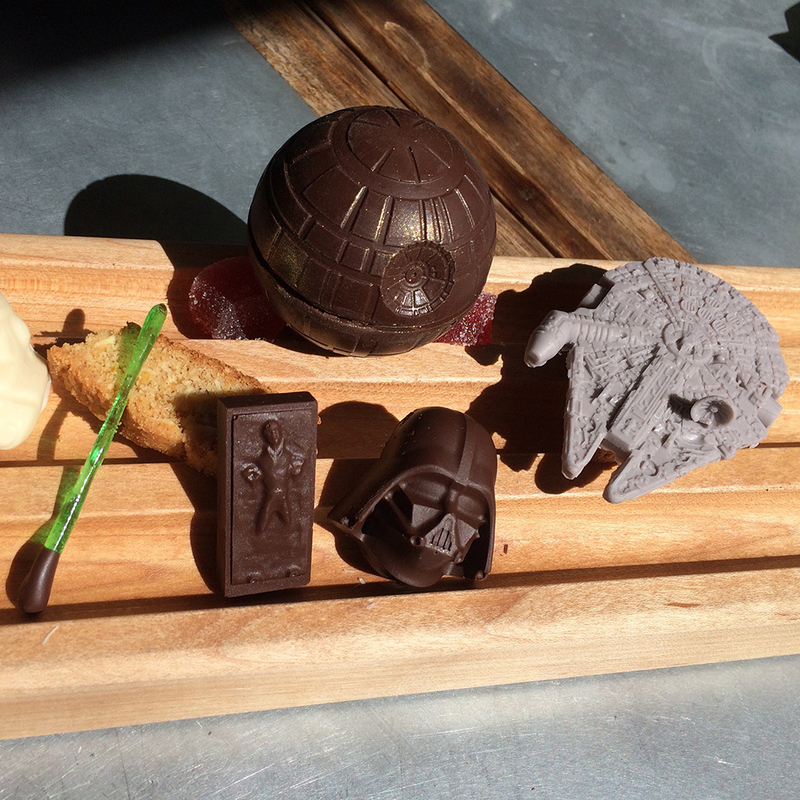 These desserts combine three of your favorite things: secret menus, chocolate and, of course, Star Wars. Faith & Flower, a high-end restaurant in downtown Los Angeles, is offering a limited time selection of Star Wars chocolates on an off-menu dessert tray for $23. This mignardise plate comes with highly detailed chocolates in the shapes of the Death Star, the Millennium Falcon, Darth Vader's head, a Stormtrooper's head and Han Solo frozen in carbonite. As if all that chocolate weren't enough, the plate also comes with a candy lightsaber, honeycomb, biscotti, a macaron and truffles. The restaurant first teased the plate with an image of the gray Millennium Falcon chocolate, saying, "Our chocolate Millennium Falcon: It's the bonbon that made the Kessel Run in less than 12 parsecs." This plate is the creation of pastry chef Josh Graves, a longtime fan of George Lucas's films. Graves said that each Millennium Falcon chocolate takes 15 to 20 minutes, and the molds take 16 hours to make. The molds, of which there are currently only a few, are cast from a Hot Wheels toy of the ship. Single Vader heads, made of much thicker chocolate, take an entire hour. For more of Faith & Flower's creative confectionery, follow the restaurant on Facebook, Twitter and Instagram.